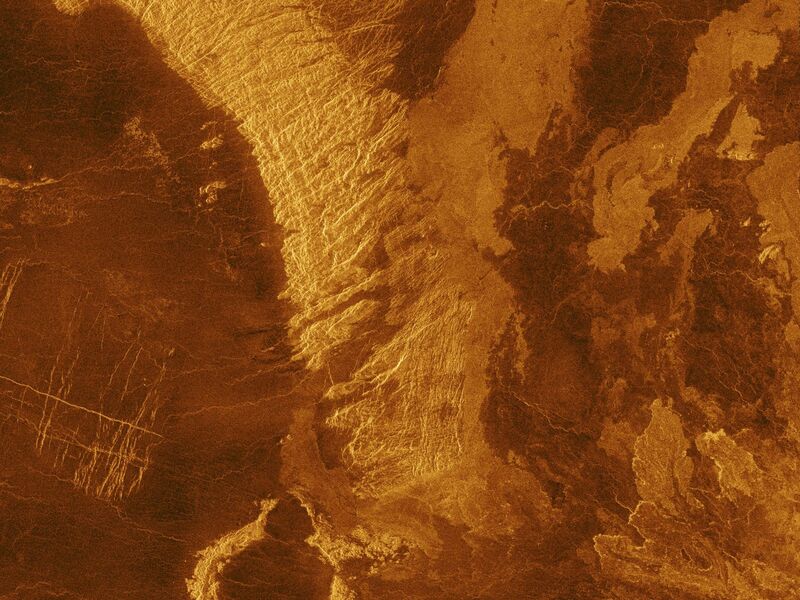 This false color Magellan image shows a portion of Leda Planitia (plains) in the northern hemisphere of Venus, centered at 41 degrees north latitude, 52 degrees east longitude. The area is 220 kilometers (135 miles) wide and 275 kilometers (170 miles) long. This image was produced from Magellan radar data collected in Cycle 2 of the mission. Cycle 2 was completed January 15, 1992. The area was not imaged during the first cycle because of superior conjunction when the sun was between the Earth and Venus, preventing communication with the spacecraft. 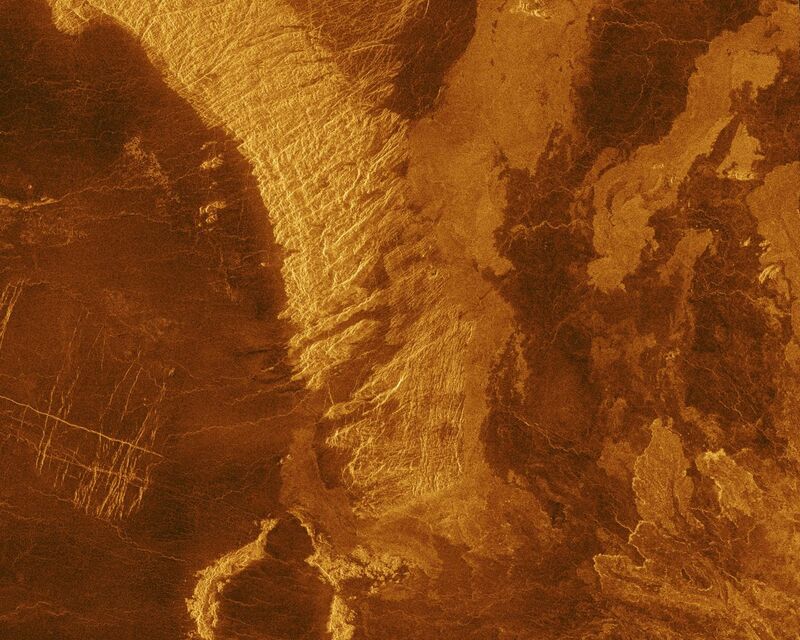 This image contains examples of several of the major geologic terrains on Venus and illustrates the basic stratigraphy or sequence of geologic events. The oldest terrains appear as bright, highly-fractured or chaotic highlands rising out of the plains. This is seen in the upper left, or northwest, quadrant of the image. 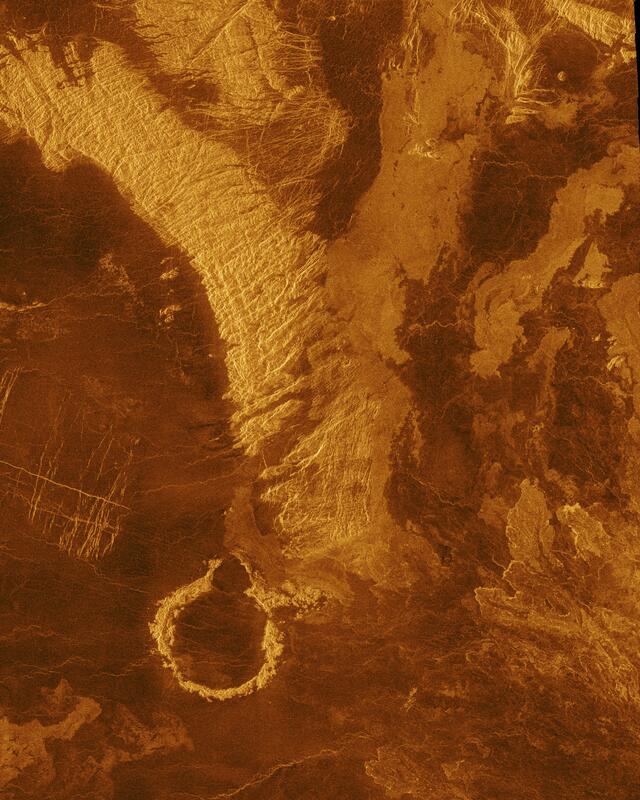 The chaotic highlands, sometimes called tessera, may represent older and thicker crustal material and occupy about 15 percent of the surface of Venus. The circular ring structure in the lower left of the image is probably an impact crater. This 40 kilometer (25 miles) diameter crater has been given a proposed name, Heloise, after the French physician who lived from about 1098 to 1164 A.D. The crater was formed by the impact of an asteroid sometime before the plains lavas embayed and covered the region. The plains surround and embay the fractured highland tessera. Plains are formed by fluid volcanic flows that may have once formed vast lava seas which covered all the low lying surfaces. 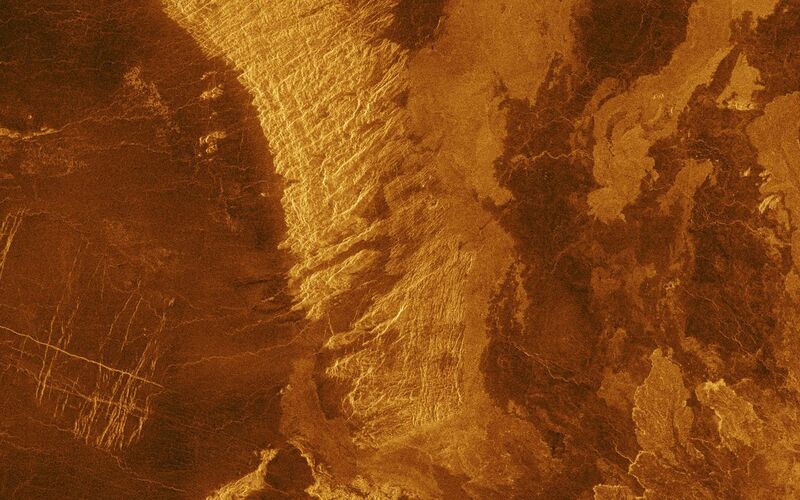 Plains comprise more than 80 percent of the surface of Venus. The most recent activity in the region is volcanism that produced the radar bright flows best seen in the upper right quadrant of the image. Those flows are similar to the darker plains volcanics, but apparently have more rugged surfaces that more efficiently scatter the radar signal back to the spacecraft. Thus the geologic sequence is early fracturing of the tessera, flooding by extensive plains lavas and scattered, less extensive individual flows on the plains surface. Impact cratering occurs throughout geologic history and provides a rough estimate of the time scale. Craters larger than a few kilometers in diameter form on Venus, as they do on Earth, at the rate of about one per million years, with smaller impacts much more frequent than larger ones. The simulated hues are based on color images recorded by the Soviet Venera 13 and 14 spacecraft.